My eight baby chicks which arrived May 18th, 2010 are now three rooster and five hens. The one bird I wanted to lay blue and green eggs is of course one of the roosters! 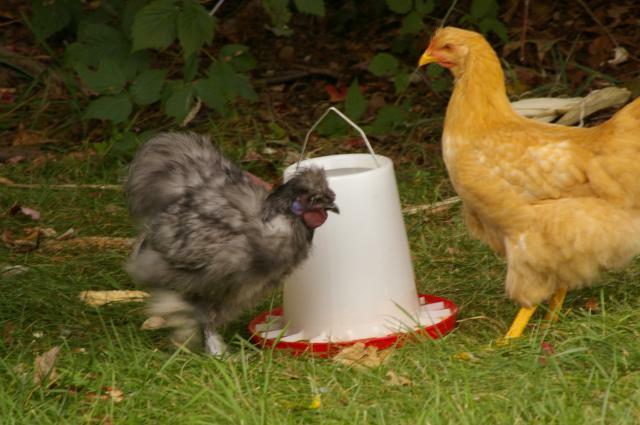 The other roosters are a Blue Slkie and a Black Silkie, very sweet and docile too. 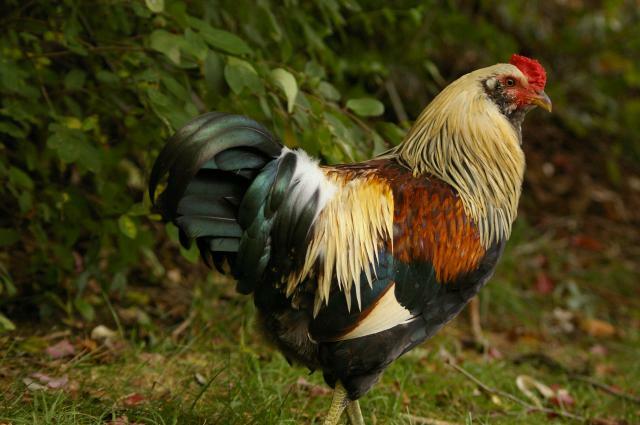 The Easter Egger rooster is gorgeous and we don't want to give any roosters up. The Easter Egger is loud though so we are going to try keeping him inside our garage at night to muffle any sound to keep neighbors happy. I've read all sorts of posts of people bringing their roosters in garages, basements, laundry rooms at night so they won't bother the neigbors. Hope this works because he is a handsome guy who takes care of the hens. We have another Silkie roo. We'll we've had him all along but he just came "out of the closet" and is admitting he's male by his pathetic broken soft crowing. Also when our Easter Egger roo (above left) mounts a hen this little black Silkie roo charges over and knocks him off the hen and then mounts her himself! So out of 8 hens we ordered from My Pet Chicken, three of them turned out to be roosters. But they are sweet and we love them so they are staying. Also we got our first tiny gorgeous egg today. A little White Silkie laid it. Not the Chantecler or Australorp or our Silver Laced Wyandotte. Nope, it was one of our little White Silkie hens that is about one third or less the size of those other big fat hens. Also since we insulated our winter chicken coop we no longer have to keep the roosters in our garage for sound muffling. We can barely hear them crow in their new sound muffling coop so the neighbors won't be bothered.